…is because I always honour them. If I don’t make ’em I can’t break ’em. Or something like that. I thought that this would be a year of catching up on things at home. Boring stuff, mainly, but stuff that needed doing. The house needs cleaning. I mean cleaning beyond the regular Hoovering. Repainting, maybe. The garden! Well, that had become a jungle, and a very scruffy one, at that. Other things, too. I thought I might draft some new pattern blocks and start sewing again. And the only keyboard my fingers touch these days is this one. And various art and writing projects that I’d started and then lost my focus. And things I had agreed to do, assuming I had plenty of time. Funny how the things one thinks seem to rearrange their order, quite independently.. . Suddenly, a trip to New York seemed, then was, doable. New York! What a mad, magnificent place. I was on a ‘plane to JFK ( with further bookings to England and France!) before any more dust had had time to settle. Or maybe it did settle and I just didn’t notice! And suddenly, I was fastening my seatbelt for landing at Vancouver! And now the shops and lamp posts have tinsel and ho-ho-ho-ing* Santas and I’m still nowhere near that fabled land of Allcaughtup. Where the hell IS it? Not even Google Earth has co-ordinates. But…I promised. So these things will be done. While my neighbour has been away I have been watering his garden. I regard it as an extension of my garden! The other day I took the camera and was glad I had. Not very clear, but he was rather a long way up a very tall tree and I was standing on a delicate wrought iron chair and trying to avoid a garden sprinkler. 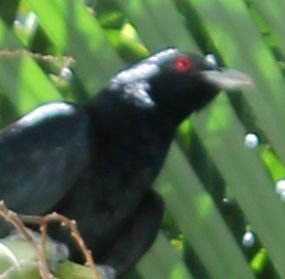 It’s my friend, the Koel. A lot of people think his call is annoying. It doesn’t bother me, but I think there is an audio clip in that link (if not that link, I’m sure google can find one!) so you can determine whether he’d annoy you. And the header? It’s a Cedar Bay Cherry.Yummy! 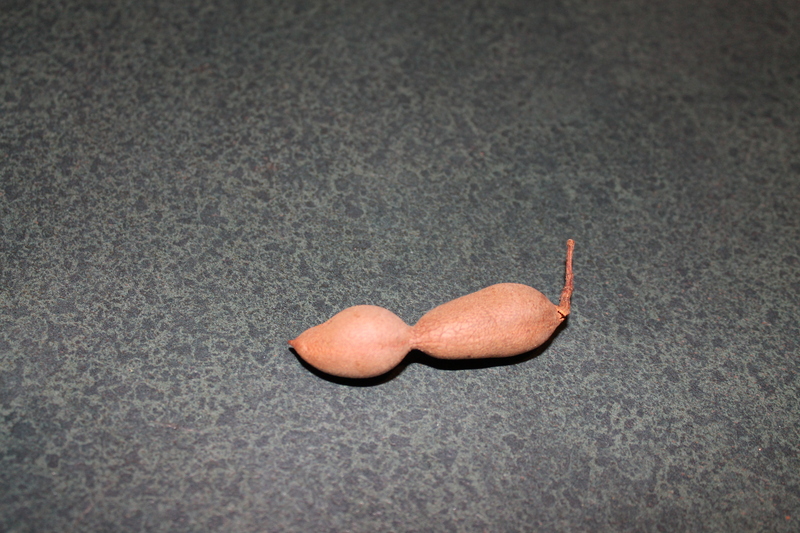 Birds had already pecked at the fruit so I ate what was left and planted the seeds. *you don’t want to know how to tell the difference! * why does Santa say that? Doesn’t he know he could be arrested? Well, not on my person, you understand. At least, not now that I’ve washed them off. 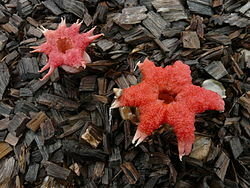 But the little blighters (polite term) have been sucking the sap out of several plants. And the ants (no polite term for these bastards!) are husbanding them. I tried the soapy water trick and got nowhere ( mind you, the leaves were nice and clean!) so this morning I said some “magic words” and drenched said bastards with white oil. Just hope Mr. Murphy’s famous law doesn’t apply! Anyway, what with messing about in the garden and one thing and another…I didn’t get around to posting the mystery picture result. 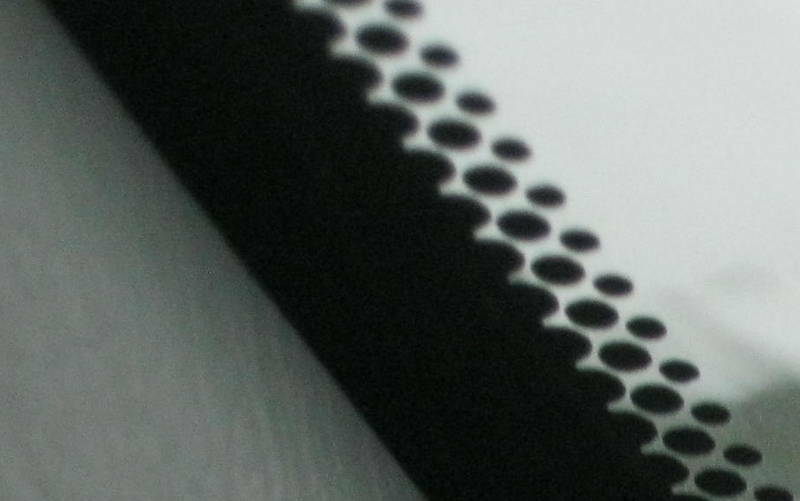 It’s that strip of dots on the edge of my windscreen; something to do with the lamination process, I think. 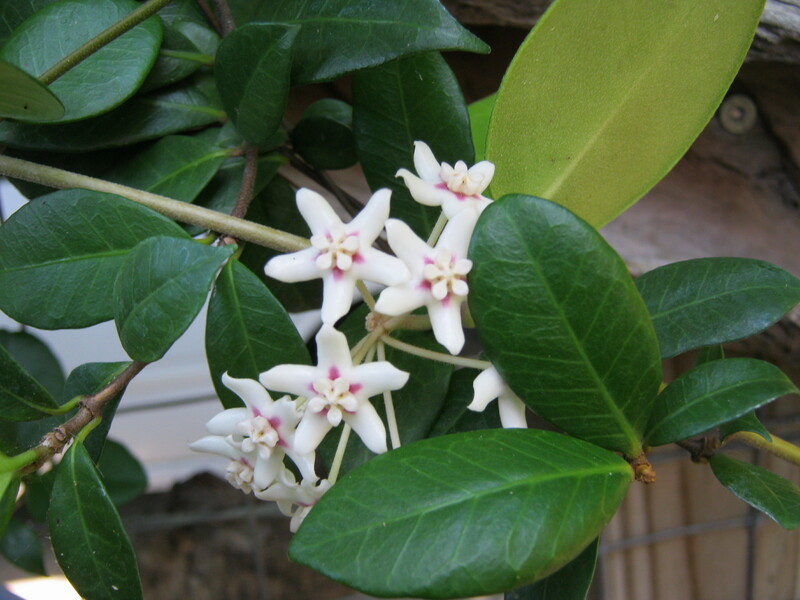 A hoya. No, I have no idea of its name. But I’m rather chuffed at having flowers as something usually chews through the buds before I even get to see what colour it will be. Now I know. Want to see more? Enter hoya in Google Images. 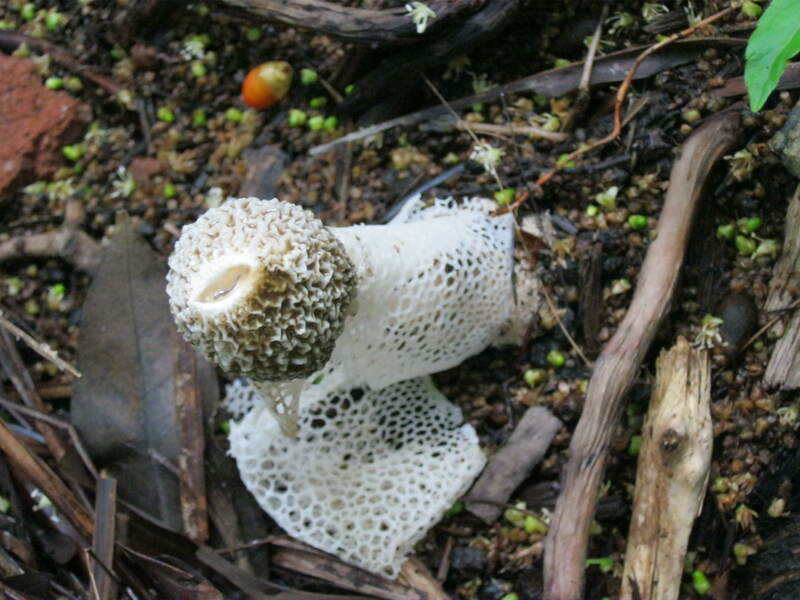 I’ve mentioned stinkhorns before. A bumper crop came up recently after the heavy rain. Mercifully, the sun came out and burned them before things got too smelly.http://en.wikipedia.org/wiki/Phallaceae Lacy and not unattractive to look at. But perhaps not what you really want below the dining room window! The first time I saw one (not the variety above) I thought something had decapitated one of my roosters! 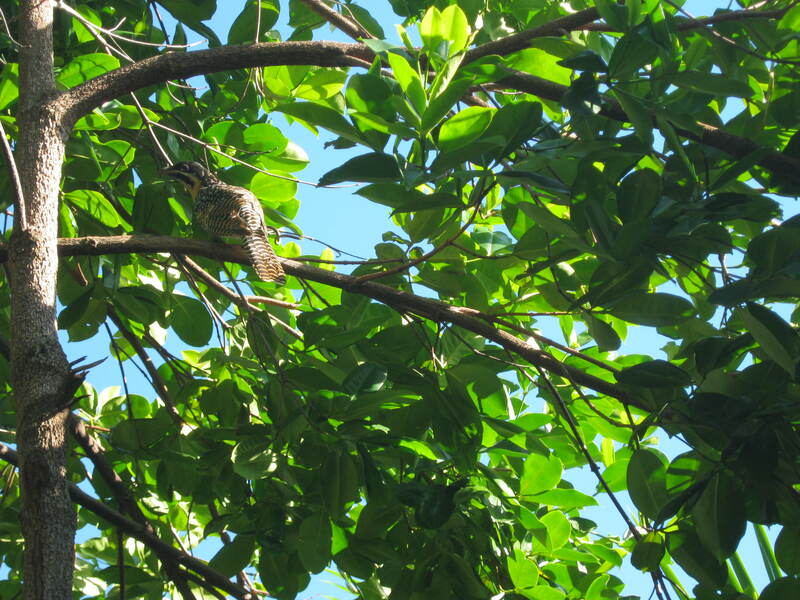 I spent ages the other day, scrambling through the garden, trying to get a good photo of what I thought was either a phaesant coucal or a juvenile female koel. Yes, a quite lovely shot of carallia and terminalia leaves! Ooh!look! there’s a koel up there! Many people go bonkers at the koels’ calling all night. Personally, I’d far rather hear the koel than the little yapster that goes off his (very tiny) brain when the telephone rings! Well, Friday Visuals didn’t have quite the right “ring” to it! I like Fridays. I suppose most people do, especially when it marks the end of the working week. Even when I worked peculiar shift hours, like a 12 hour day on Fridays, and more than one job, I still liked Fridays. Probably something we learn in early childhood when we’re shunted off to that nine-to-three-Monday-to-Friday existence for 10 or 12 years. We used to call it “POETS Day.” Desks would be cleared in time for Happy Hour at whichever watering hole was in favour. The Station Hotel, in Auckland, worked a neat little loophole in the law: because the Station had a restaurant, patrons could sign “the dinner register” and drink at the bar until “a table became available.” Lost count of the times I signed that book! Oh! I’ve just remembered that I actually did have dinner there one night.A “geen u wine” business dinner! But what about the visuals? 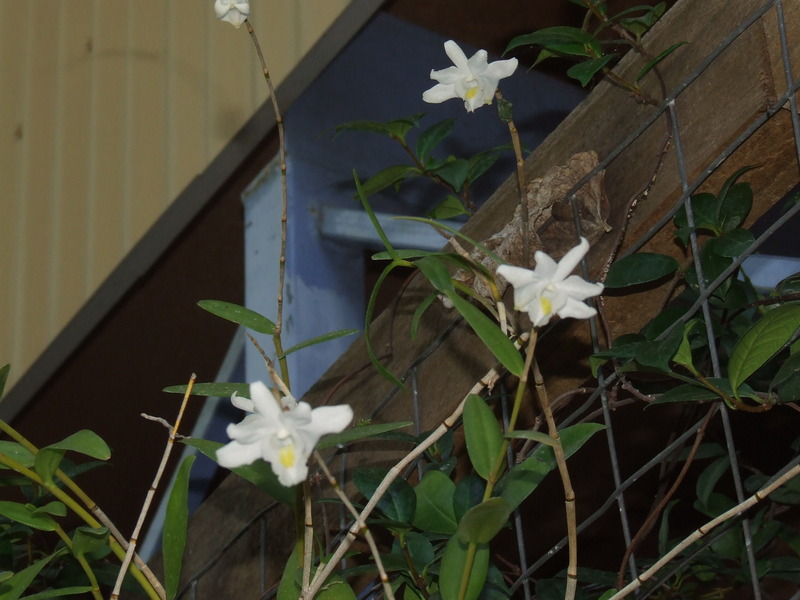 I hear you clamour…how about a picture of an orchid? 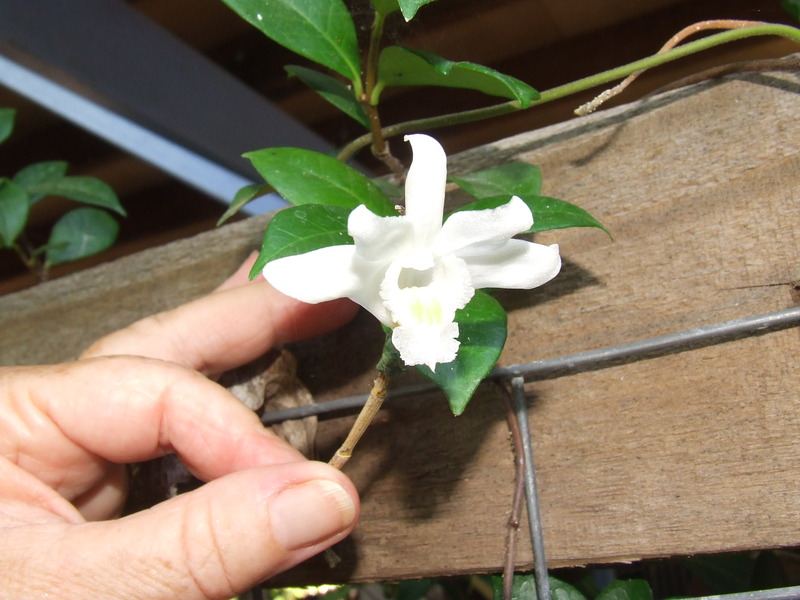 Dendrobium crenutatum, the dove orchid. You can stand all day with a hose running on it, but it only flowers after rain. 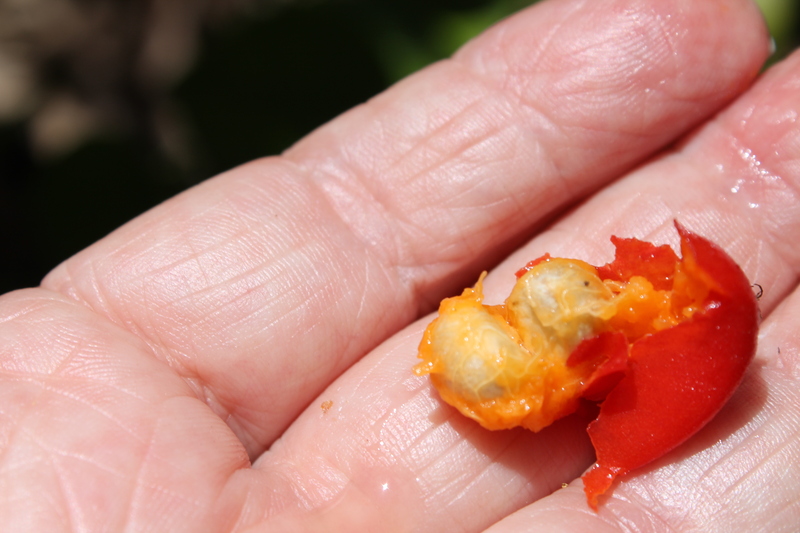 And the flowers wither after a day or so, but they are incredibly spicy-sweet! This one is wired onto a piece of a branch as they’re happy little epiphytes, but I’ve seen pictures of them in the ground. I think some of my readers might be impressed by this art display. I certainly was! I wonder how long it took her to thread all those things! 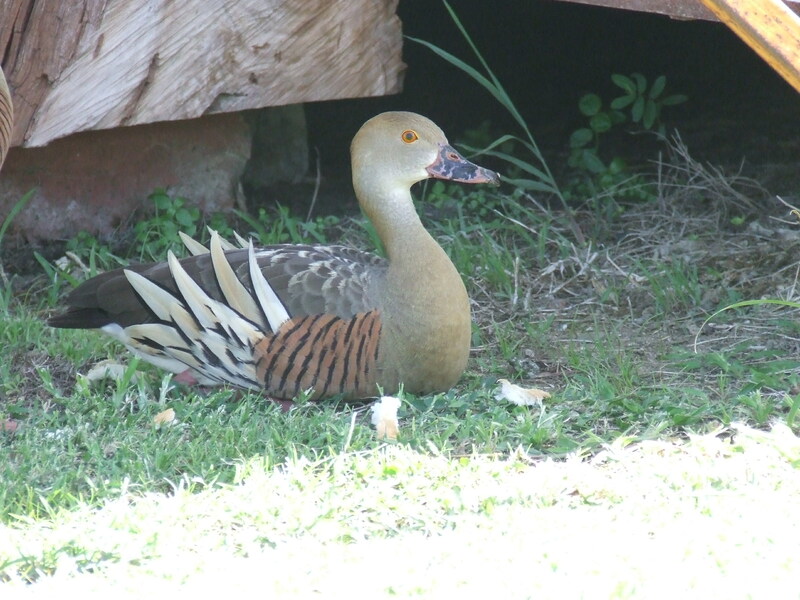 Among the sounds I often hear at night, when neighbouring ghetto-blasters and tyre-squealers are silenced, are the calls of Whistling Ducks. This is a lousy poorly-lit photo I took last week at my local green waste facility (poncey term for rubbish dump!). What about those tiger stripes!This pair seems to have made a cosy home in the dump superintendent’s garden area. 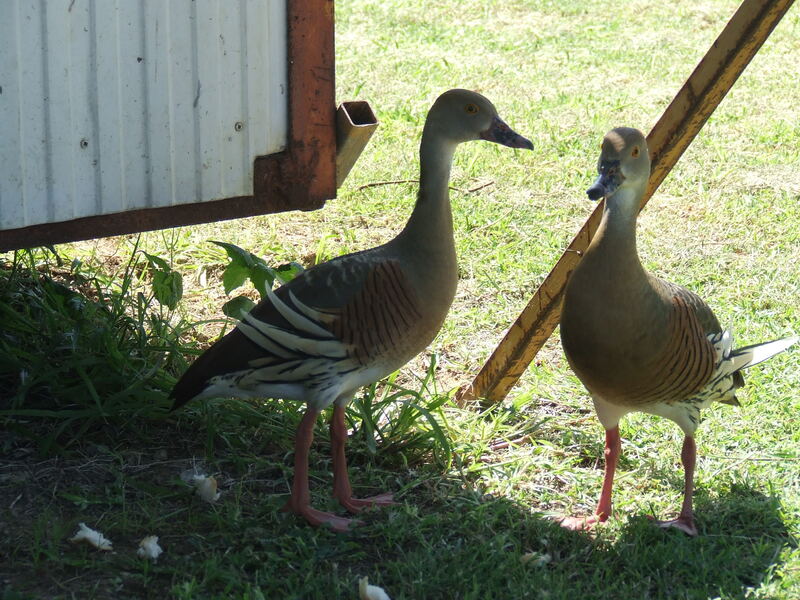 I say “pair” as they seem to be a ducky item and this is breeding season. I’ve never managed to get close enough to photograph them til now as wild ones tend to be on the skittish side. But the dump man says they are used to him and would not mind my presence. Too bad they wanted to stay in the shade! Here’s a better one.And here’s an audio clip. 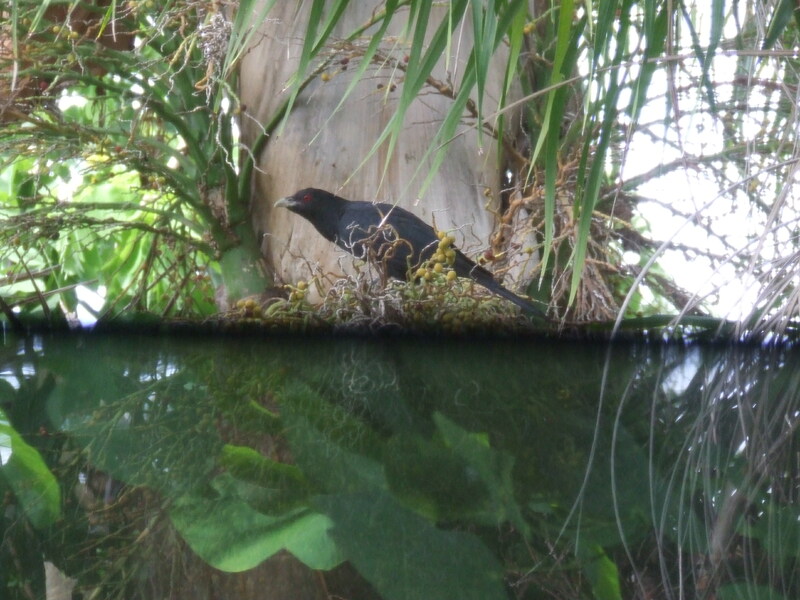 A koel, through the screened (and rain-dirty) window – not bad! Of course, he flew away the minute I went outside!Probably fed up with the incessant bloody noise!